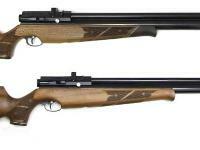 Top picture is the walnut stock. Note the dark cap on the front of the forearm. Bottom picture is the beech stock. Top is walnut, bottom is beech. A manometer (air pressure gauge) tells you how much air is left in the reservoir. The silver disk in front of the sidelever is a power adjustment wheel. 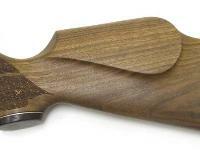 Checkered grip and raised cheekpiece top off a magnificent gun! 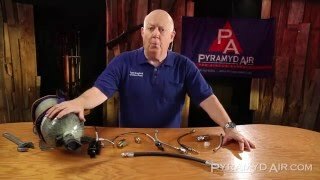 The S410 is the 10-shot version of the S400 precharged pneumatic, but it also has the added benefit of adjustable power. You'll get about 60-80 shots on low power and 30-40 on high. 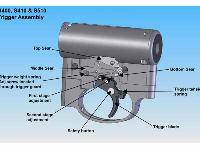 The power adjustment wheel is located on the right side of the rifle. The low end delivers about 600 fps, the high about 920 fps (.22 cal.) The variable power makes this a much more useful gun for dispatching small and large pests at distances other guns can only hope to achieve! On the top end, you'll see remarkable energy in the range of 30-35 ft-lbs. This whopping power will serve you well when the time comes to quickly and humanely dispatch pests. Of course, power is nothing without accuracy. And, this gun has it in spades! 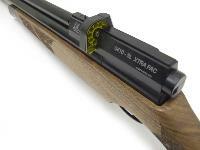 It comes with a 12-groove Lothar Walther barrel, the cream of the crop when it comes to accurate barrels. If you do your part, the gun will do its part every time! And, the shrouded barrel helps deaden the sound so the report won't spook the very critters you're hunting. 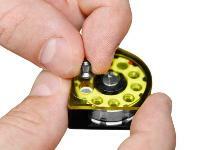 The two-stage adjustable trigger lets you customize things according to your own needs. It also has a quick-release charging connector. 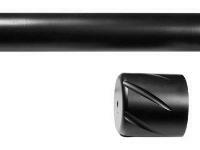 Manufactured in Air Arms' state-of-the-art facility in England, the S410 sets a new standard for accuracy, power and versatility in precharged pneumatics. There are no sights on the S410; remember to buy a scope & mounts! Click on the AMMO link for suggested pellets and the ACCESSORIES link for scopes, mounts, targets, cleaning gear and more. Things I would have changed: I'm going to keep this one "AS IS"!!!! What others should know: This will be the gun that will be passed down, when I'm gone. Things I liked: I purchased the .22 caliber rifle in walnut and it is gorgeous. Workmanship is beautiful and the gun is supremely accurate. 1/4 inch groups at 45 yards no problem. 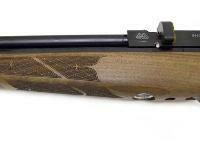 The bluing on this gun is better than my Weatherby MK V. Also, I would like to thank Gene in the tech department. I had an issue with a defective S410 initially and Gene got involved and took the time to make sure the replacement gun was perfect in every way. Kudos Gene! What others should know: The power adjustment on this gun is very useful. 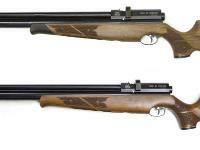 Not only does it give you a range from 14 to 36 ft lbs, which takes you from backyard plinking up to small game hunting at the twist of a dial, but once you do some chrony testing it is possible to get some really long shot strings at level well above that of a magnum spinger (25 or so ft lbs) by starting at half power and adjusting upward at predetermined points. Also, JSB heavies are the perfect fodder for this gun. 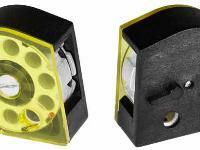 Heavy enough to withstand some wind and light without drifting but light enough to easlity nail targets accurately out to 110 yards and beyond. 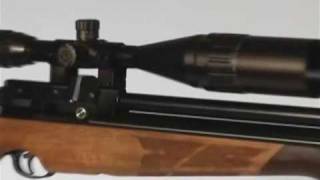 Things I liked: the AirArms S410 FAC. 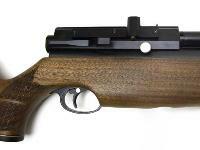 Is a superbly crafted rifle. Every component of this gun is flawless. from the ergonomic stock, to the rugged and reliable action, to the overall fit and finish. 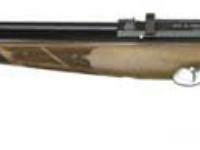 This gun is cocked using a side lever action which I find to be a improvement over the traditional bolt action. The outstanding accuracy obtained with this gun is really impressive. 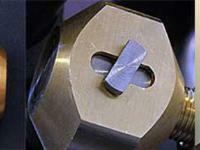 I am getting 1/2" fifty yard groups that opened up to 1" at 100 yards. It is a dream to shoot. The rifle is spitting out pellets at a avg. velocities of 915 fps, using the JSB 18gr pellets packing a walloping 33ft/lbs. The shrouded barrel is very quiet. 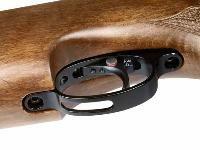 AA S410 FAC is one of the finest PCPs available superb accuracy excellent trigger and beautiful. Things I would have changed: can’t find anything lacking or wanting for improvement with this gun. What others should know: Buy a extra magazine and lots of pellets you will shot through them faster then you think. This is comprised almost entirely of quotes from Jim Chapman's (The American Airgun Hunter) review. 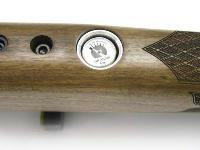 Beech stock, rich checkering, adjustable power, 10 powerful shots!